The Duchess of Abercorn, founder of the Pushkin Trust, welcomed 100 guests including guest of honour Mr. Alexander Kramarenko, Minister-Counsellor of the Embassy of Russia to Great Britain and Northern Ireland, to the Pushkin Trust’s 25th Anniversary Dinner. 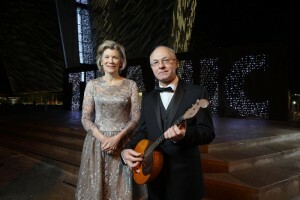 The event for supporters and benefactors was held in Titanic Belfast to celebrate the success of the Northern Ireland-based charity’s work in the field of creative education and learning. Entertainment was provided by a traditional Irish band and Mazaika, a Russian band playing a variety of cultural folk, gypsy and operatic musical pieces. The Pushkin Trust was founded in 1987 by the Duchess of Abercorn, a direct descendant of the acclaimed Russian laureate, Alexander Pushkin. It has inspired over 50,000 children, teachers and student teachers through its creative education programmes, including Snow Patrol singer, songwriter and musician, Johnny McDaid. Earlier this year the Pushkin Trust celebrated their silver jubilee year with a musical event, led by Belfast-educated singer Katie Melua, at the Grand Opera House. To see more photos from the evening please visit Belfast Telegraph.